We understand how important quality is to you. Our sputter process has been designed to deposit ultra-clean metal and dielectric films. 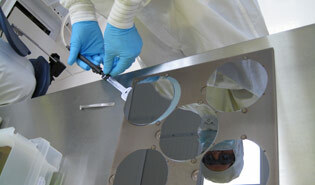 All wafer processing, including metal deposition, is performed inside our class 100 cleanroom. An in-situ RF etch is added to the process to insure good film adhesion and ohmic contact to underlying conductive layers. In addition to an In-situ RF etch, we can provide an HF-dip just prior to sputtering aluminum and aluminum alloy films. Adding this additional step can further increase ohmic contact between layers. Sputtered metal deposition is an omni-directional process. For this reason, sputter deposition is not a good candidate for Lift-Off processing. If you are interested in metal for Lift-Off processing please see our E-beam evaporation metals page. 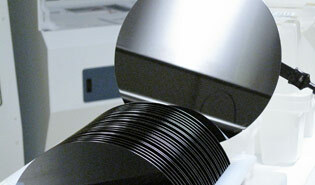 All sputter films are available on silicon wafers sizes up to 300mm in diameter. We can also provide sputtered films on non-silicon materials, including quartz and glass wafers. We offer a wide variety of sputtered non-precious metals, dielectric films, and silicon. Precious metals are available for E-Beam evaporation.